As part of the transition to Google’s new photo hosting and sharing service, Google Photos, launched this May, users of Google’s older Picasa desktop software are now being prompted to upgrade to Google Photos Backup for saving their images to Google’s cloud storage. The change could signal the beginning of a plan to migrate Picasa users over to the newer Google Photos web service. However, Google Photos Backup is a desktop uploader program only – it’s not a replacement for Picasa’s desktop software, which also features tools for organizing photos into albums, favoriting items, or filtering by photos or videos, and more. Noticed yesterday that a Google Photos Backup tool was suddenly installed after running Picasa on my machine. Following the installation of this update, Picasa users are then prompted to download and install Google Photos Backup the next time they launch their Picasa desktop software. Fortunately for those who still prefer the Picasa experience, the prompt can be dismissed for now by clicking on the “No Thanks” button, which allows you to continue to use Picasa as usual. Those who do click “Get Google Photos Backup,” though, are redirected to the apps download page on the Google Photos website. From here, they can choose to download the same desktop software uploader tool that’s previously been available to Google Photos users. This app makes it easier to upload photos and videos stored on your computer, or from attached cameras and storage cards, into the Google Photos online service. For the time being, it doesn’t look like Picasa on the desktop is actually being replaced by a Google Photos desktop app, though it’s certainly arguable that the time has come for Google to finally put Picasa to rest. That service and its accompanying apps are older, dated in both thier look-and-feel and functionality, and don’t include some of Google Photos’ cooler tricks like its automated montage-building assistant, for example. Google today needs to better consolidate its photos experience for end users. For months following the release of Google Photos, it still featured photo storage via Google+ Photos – the photo uploading and sharing component to its social networking service, Google+. Only this week did the company announce that it would finally shut down Google+ Photos on the web, Android and iOS. Google even admitted that having multiple offerings is “confusing to users” in its announcement about this. But Google+ Photos has not been the only source of end user confusion. The company has also stubbornly hung onto Picasa over the years as well, even as it rolled out upgraded experiences like Google+ Photos. 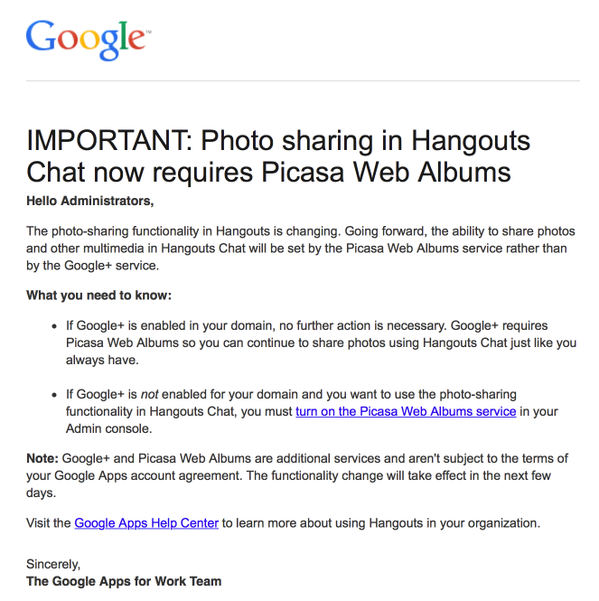 And more recently, related to the closure of Google+ Photos, Google sent a letter to Google Apps administrators which said that they would have to enable Picasa Web Albums to continue sharing photos in Google Hangouts, after the shutdown of Google+ Photos. Which frankly, is just crazy. Google’s muddled photo strategy also included a dedicated Chromebook app, which is now being dealt with, too. Back in summer 2013, Google launched a Google+ Photos application on Chromebook, but that app is being discontinued as of this week according to a note on the Chrome Web Store page and an FAQ on Google’s support site. (Actually, it no longer works as of July 21st, 2015, says Google). The Chromebook app users are asked to move to photos.google.com instead. Of course, there is still a lot of love out there for the Picasa brand and it has solid name recognition with a mainstream user base, which could explain why Google has hesitated to force a transition to Google Photos. But at some point, it doesn’t make sense to spend the resources to maintain a dated and aging service which duplicates much of the functionality in Google’s flagship Google Photos product. Despite the potential backlash from Picasa customers, it’s time for Google to bite the bullet and close Picasa for good. After all, the company has no problem shutting down services its users love, right?